On November 16, 1997, the CBS affiliate in Los Angeles, KCBS, broadcast the first of a three-part series regarding restaurant hygiene. Using the increasingly popular “hidden camera” technique, the local news exposé took viewers behind the scenes into a number of restaurant kitchens. The series revealed a smorgasbord of unsanitary practices that—according to the series—were common in restaurants throughout Los Angeles County, despite the presence of an aggressive restaurant hygiene monitoring system maintained by the county. The anecdotal evidence in Los Angeles, however, was indicative of amore widespread problem. Food-borne pathogens cause an estimated 48 million cases of illnesses, 128,000 hospitalizations and 3,000 deaths each year in the United States. The Centers for Disease Control (CDC) estimate that nearly 50 percent of food-borne disease outbreaks are connected to restaurants or other commercial food outlets. The public outcry arising from the investigative series led the Los Angeles County Board of Supervisors to legislate transparency to informthe public about hygiene conditions in all restaurants in the region. They unanimously adopted a disclosure requirement on December 16, 1997 (one month after the series was aired), which went into effect on January 16, 1998. The county ordinance requires public posting of restaurant hygiene grades (A, B, or C) based on Los Angeles County Department of Health Services (DHS) inspections. By making these grades public, the Board of Supervisors sought to reduce the effects of food-borne diseases by putting competitive pressure on public eating establishments with poor hygiene practices. Not surprisingly, the requirement was opposed by the California Restaurant Association (a statewide trade group), as well as by many local restaurant associations. Although the transparency requirement was adopted at the county level, individual citieswithin the county were not required to adopt the ordinance (all but ten had chosen to do so by the end of 2005). The system builds directly on the health inspections conducted regularly by the DHS. Health inspections cover a range of very specific practices, including food temperatures, kitchen and serving area handling and preparation practices, equipment cleaning and employee sanitary practices, and surveillance of vermin. Each violation receives one or more points. Cumulative points are then deducted from a starting score of 100. A score from 90 to 100 points receives an A, 80 to 89 a B, and 70 to 79 a C. Cumulative scores below 70 require immediate remediation by the restaurant owner, which may include suspension of the owner’s public health permit and closing of the restaurant. The transparency system requires restaurants to post the letter grade arising from the most recent inspection on the front window. A searchable Web-based system includes inspection grades, numeric scores onwhich the gradeswere based, and a listing of specific violations found on the last inspection. Restaurants receive two or three unannounced inspections and one reinspection, upon request, per year. Thus, although the posting of grade cards entails relatively small costs, the systemrelieson a large number of inspections (about seventy-five thousand in 2003) and therefore means a sizable enforcement budget for the DHS. The introduction of the new transparency system led to fairly rapid and significant changes in the overall grade distribution in county restaurants (as noted, the grading system existed before the disclosure requirement). When the program began, 58 percent of restaurants received an A grade, a number that grew to 83 percent by 2003. The incentives to improve are significant. Researcers Ginger Zhe Jin and Phillip Leslie analyzed the impact of restaurant grades and found that after grade posting, restaurants receiving an A grade experienced revenue increases of 5.7 percent (other factors held constant); B-grade restaurants had increases of 0.7 percent; and those with a C grade had declines in revenue of 1 percent. 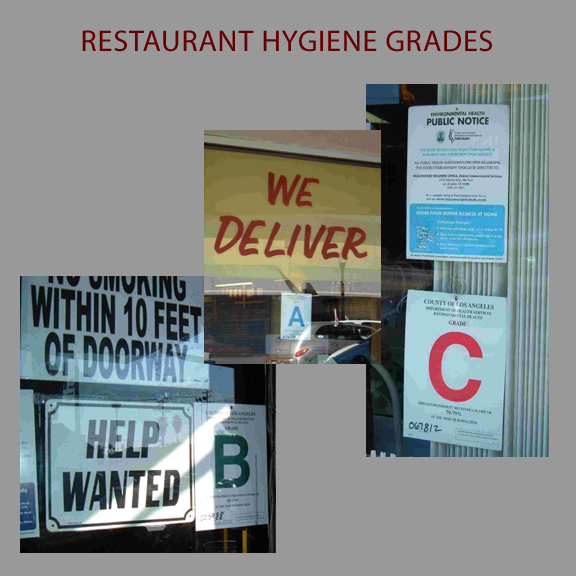 The introduction of grades also improved hygiene at franchised units in chain restaurants. More important, studies found significant decreases in food-borne-illness hospitalizations, ranging from 13 percent to 20 percent. The system is not without its problems. There is some evidence that inspectors have become more lenient over time. Daniel Ho at Stanford Law School found limitations in this disclosure system. His research found that hygiene transparency led to grade inflation in San Diego and that there were significant inconsistencies among inspectors' scores in New York. Some critics of the system have argued that it is incompatible with the standard food preparation practices of certain ethnic groups who therefore face an unfair disadvantage from the grading system. Similar restaurant hygiene disclosure systems have been adopted by other states and cities, including Georgia, Mississippi, Hartford, Connecticut and Louisville, Kentucky.